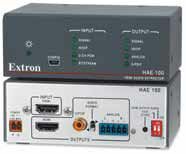 The Extron HAE 100 is an audio de-embedder that extracts the audio from the HDMI signal and provides outputs for analog stereo and digital S/PDIF audio. The HAE 100 supports data rates up to 6.75 Gbps for compatibility with HDMI 1.3 Deep Color. It is HD CP compliant and compatible with video resolutions up to 1920x1200, including 1080p/60. The HAE 100 is equipped with several integrator-friendly features, including a buffered HDMI video output with EDID Minder for simplified EDID management between the input source and the display, plus input cable equalization and comprehensive LED status. Atlona Technologies has released three cost-effective custom installation testing kits designed to diagnose 99-percent of all digital connectivity issues in moments. The AT-KI T-HD 1, AT-KI T-PR OHD 2, and AT-KI T-PR OHD 3 kits combine an HDMI signal generator and seven-inch HDMI monitor in a high-quality Pelican case while the AT-KI T-PR OHD 3 also features the AT-HD Sync HDMI EDID emulator and AT-BAT-DI S7PR O monitor battery. All testing kits released today include the Atlona AT-HD 800 portable HDMI signal generator. The AT-HD 800 allows users to diagnose specific resolution, video timing, EDID , and color space issues in any DVI or HDMI video system. The AT-HD 800 features 13 test patterns, including 3D tests side-by-side, top and bottom, and frame packing, a format that is mandatory for all HDMI 1.4 devices. This powerful pocket-sized signal generator features an HDMI output as well as an HDMI pass-through to easily switch between test patterns and content from any other digital sources, while also giving the ability to read the EDID from the input source and showing it on the display. The GefenPR O Extenders have the ability to send multiple signals over the same Cat-5 cable, including power to the remote receiver with an additional 5 volts to drive a supplemental piece of hardware. A single Cat-5 cable connects any HD source to any remote display up to 330- feet (100m) in distance. Digital audio/video in the HDMI format, IR remote, RS-232 control, Ethernet and power are delivered over the same Cat-5 cable to the remote location. Inventive ELR technology from Gefen based on HD BaseT standards means 1080p full HD , deep color, 3DTV support and all cutting-edge features of HDMI are delivered long range distances with a perfect replication at the receiving end. Another significant advance is Gefen’s POL technology, which enables the sender unit’s connected power to deliver power over the Cat-5 cable to the receiver, and still be able to power an additional device such as a splitter or switcher. No power cord is needed in the viewing are, further enhancing the aesthetics of the system. Shure Incorporated’s PG X Digital wireless system adds the clarity and precision of 24-bit/48 kHz digital audio to the proven reliability of analog PG X wireless products. PG X Digital combines superior digital sound, extended battery life, and the convenience of the 900 MH z band with the user-friendly simplicity that has made PG X Analog a perennial favorite. Like its analog sibling, PG X Digital offers a wide range of system configurations for vocalists, guitarists, and presenters. Handheld systems have been designed specifically to match the unique sound signatures of trusted microphone options like the cardioid SM58 and supercardioid Beta58A. Instrument systems come with either the Beta98H/C clip-on instrument mic or the WA302 guitar cable. Presenter systems include either the WL185 cardioid lavalier, WL93 omnidirectional lavalier, or PG 30 headset. All systems ship with the PG XD4 diversity receiver and a padded carrying case. Auralex Acoustics’ SonoLite fabric wrapped StudiofoamPro panels allow the company to expand its customer base by reaching everyday musicians who want to treat a variety of studio spaces. SonoLite is a 2- x 2- x 2-inch thick fabric wrapped StudiofoamPro panel, available in black or beige, with squared edges that provides an overall noise coefficient rating (NR C) of 0.75. Harris’ Selenio is an integrated media convergence platform. Selenio is flexible and modular, making it suitable for any fixed or mobile production environment, broadcast facility or digital terrestrial redistribution head end (DV B-T/T2, ATSC, M/H, ISDB-T), as well as cable, satellite and IP TV head ends. Selenio provides an energy-efficient solution that enables service providers to support content from multiple sources and deliver it over multiple platforms. Operational benefits of the Selenio media convergence platform include intelligent, efficient management of IP , compressed and baseband signals, reduced control complexity, simple deployment and increased functionality in a smaller footprint. The high-density, modular architecture lowers total cost of ownership by reducing installation, maintenance and upgrade costs. Analog Way’s Axion2 is designed for live events and multi-screen venues, and is compatible with Analog Way’s new generation of seamless switchers including: Di-VentiX II , Eikos and Eikos LE, OPS300, OPS200, Smart MatriX and Smart MatriX LE, Smart Edge, Smart Quad, Pulse and Pulse LE, SmartVu and SmartVu LE. The seamless switchers can be controlled either as stand-alone processors or in combination, including Soft Edge Blending configurations. Axion2 can control up to 6 independent screen configurations in different locations (single display or multiple projectors in Soft Edge Blended mode) and store up to 90 presets per screen configuration. Axion2 allows off-line programming so that users can start their programming when Seamless Switchers are not connected to the console. Thanks to the new sequences mode, series of presets can be created into up to nine sequences for the six different screen configurations. Barix’s Exstreamer P5 amplified IP decoder allows businesses to integrate standard loudspeakers into IP -based, in-store/on-location audio systems. Its ability to operate in high-temperature environments and support power over ethernet (PoE) distribution provides many options for system deployments. The Exstreamer P5 features a built-in amplifier and I/O connections to turn nearly any 8-ohm speaker into an IP speaker solution. This enables a true end-toend audio over IP solution for businesses and organizations pushing background music, advertising, paging and other audio content to one or more speakers, zones or locations from the entrance to the aisles, all the way to the restrooms. Retailers, restaurants, clubs, hotels, offices, schools and universities are among those that can benefit from installing the Exstreamer P5 as part of a new IP audio system or as a retrofit into existing IP or legacy systems. The P5 can also integrate with SIP phone systems to bridge telecom and security, merging audio streams and real-time paging into an efficient, centralized messaging system. Broadcast Pix’s Granite 2000 is a new addition to the Granite family of live video production systems that features a new wide 1 M/E control panel. The control panel provides a much larger work area than the popular Granite 1000, which is still available for small studios and production trucks that need a more compact system. The Granite 2000 expands the number of input buttons from nine to 16 (and reaches 32 with shift), doubles the number of keyer buttons from three to six, and increases auxiliary output buttons from two to 10. It also adds key priority controls, as well as mnemonics to display auxiliary output assignments. Broadcast Pix has also released Granite Version 1.3, which adds Fluent Clip Store to the live video production systems suite of built-in workflow tools. BSS Audio has introduced a full-bandwidth Acoustic Echo Cancellation (AEC) algorithm for its Soundweb London conferencing processors. The AEC algorithm is released with HiQnet London Architect v3.04 and can be used with existing Soundweb London AEC Input Cards and the Soundweb London BLU -101 and BLU -102 devices. The existing 8kHz-bandwidth AEC algorithm is optimized for POTS, VoIP phone system and digital phone system applications. The full-bandwidth AEC algorithm facilitates enhanced fidelity for specific applications, while also offering a reduced processing latency. Neutrik’s Multimedia Data Connectors offer a versatile and flexible solution for the transmission of any digital TV and PC video format including high-definition video (HD TV). The line includes several variations of data connectors for USB, FireWire and HDMI ports. For USB connection, Neutrik offers a new 2.0 cable and two gender changers. The NKU SB cable delivers a data rate of up to 480 MBit/s and is available in 1-, 3-, or 5-meter lengths. The NAUSB-W is a reversible USB gender changer that comes in the universally accepted D-size housing. It is nickel-plated and accompanied by a version in black (NAUSB-W-B). All three units are dust and water-resistant and comply with the IP 65 safety standard in combination with each other, further emphasizing Neutrik’s commitment to innovation. Lab X Technologies’ Titanium 411 1GB AVB ethernet switch couples Lab X’s AVB standards experience with ruggedized connectors, industry standard SFP -supporting long haul fiber, additional copper connections, and flexible mounting options. Lab X’s Titanium 411 has four rear-mount 1GB RJ 45 copper interfaces using locking EtherCon connectors, along with an SFP slot to accommodate standard fiber modules or additional copper interfaces, and network activity LED lights on the front and back of the unit. The flexibility of Titanium 411 is broadcast through a configurable 1GB locking copper interface, which can either be mounted on a rear or front panel for easy access. The units ruggedized internal power supply is connected with a locking PowerCon connector. Titanium 411 applications include flying mount deployments to networked line arrays and speaker clusters, fiber runs to remote networked equipment in space-constrained areas, and on-stage and FOH networking needs. Crestron’s TPM C-9 Tilt Touchpanel is large enough to enjoy a full, rich interactive user experience with a stylish design that remains discreet in any setting. A widescreen provides more space for designing custom graphical interfaces, and a larger display for viewing cover art, control apps and scores of other dynamic content. TPM C-9 also offers a slew of cool new media and communications tools like widgets and highdefinition streaming video for IP /web security cameras that instantly enhance whole home and building automation systems. TPM C-9 enables extreme graphics and animations, including cover flow and page flips. Gestures navigation with intelligent velocity makes finger swipe control of theater systems, lighting, AV networks, thermostats, security cameras, and any other connected home or building system fast, fun and easy. TPM C-9 is engineered to support the Crestron Core 3 OS, the foundation for its new GUI framework. Audio-Technica’s ATW-CHG 2 Two-Bay Recharging Station is designed for its 2000 Series wireless transmitters. This unit charges ATWT220a handheld transmitters and/or ATW-T210a UniPak transmitters (in any combination). Batteries are charged within the transmitters. The ATW-CHG 2 has many protective features to preserve the integrity of the transmitters. A built-in safety feature monitors cell voltage and automatically turns off the unit if problems are detected. The unit will also automatically shut off if damaged or alkaline (non-rechargeable) batteries are installed. Maintenance charging prevents battery selfdischarge until the transmitter is removed from the charger. AKG ’s Wireless App 2.0 includes a host of new features and an updated interface. Users will not only be able to monitor and configure their AKG wireless systems through an iPhone, iPod Touch or iPad, but will also have the opportunity to control multiple settings from system design, to soundcheck and during performances, all through Harman’s HiQnet protocol and a Wi-Fi connection. Adding to the capabilities of the AKG 1.0 app, 2.0 revamps the wireless system and radio frequency connection monitoring capabilities, compatible with the AKG wireless mics, including the DM S 700, WMS 4000/4500 and IVM 4 in-ear monitoring system. With a Wi-Fi connection, users are connected to the AKG HU B 4000 Q, which can be used side-by-side with HiQnet System ArchitectTM as the entire system is based on the advanced HiQnet protocol. App 2.0 also comes with a new, stylish interface as well as a more advanced, reliable, and easy-to-navigate information database. Apantac’s Crescent series includes a 1x8 reclocking distribution amplifier, an SDI to HDMI /DVI converter with looping outputs and integrated 1x2 SDI distribution amplifier, and an SDI de-embedder with integrated 1x2 SDI distribution amplifier. Existing Crescent series products include a 1x4 reclocking distribution amplifier and an HDMI to SDI Converter. The entire range of Crescent products are compact signal processing solutions for a variety of broadcast and professional AV applications. They are enclosed in metal housings and include a magnetic pad for flexible mounting. They all come standard with 5V DC external locking power supplies. Yamaha’s DSR Series active loudspeaker line, including the compact and lightweight full-range DSR112, DSR115, and DSR215, along with the DSR118W subwoofer, delivers class-leading power, digital sound processing, plus D-CONTOUR multiband dynamic processing. Integral Digital Tuning helps deliver super-clear, high definition sound quality via highperformance 48-bit digital signal processing and advanced acoustic technologies. Digital crossover networks use highorder FIR (Finite Impulse Response) filters for linear phase response, which provides better sound quality than analog crossovers. Intelligent Dynamic Control enhances sound quality with the D-CONTOUR multi-band dynamic processor that monitors output levels and varies the amount of boost in each frequency band, providing an ideal balance of dynamic sound with consistent clarity at all volume levels. The speakers powerful 1300-watt Class-D amplifiers get the most out of the DSR’s lightweight cabinets. Yamaha also developed the PF C (Power Factor Correction) switching mode power supply that helps the entire system achieve its full performance potential. Electro-Voice’s R300 receiver system is equally at home on a tabletop or in a 19-inch equipment rack. Its simple controls and easy-to-read display are designed to provide the ultimate in user-friendly operation. Rack-mount kits and front-mount antenna cables are available for professional installation. For applications with up to four receivers in one rack, the APD 4+ antenna splitter can provide antenna and power feeds. The BP-300 metal bodypack transmitter is rugged, compact, and easy to use. Using two AA batteries for 14 hours, the BP-300 is one of the most economical transmitters available for day-to-day operation. The units’ mute function keeps the RF signal live while muting the audio, protecting your channel and preventing noise in the audio system. Two preconfigured bodypack systems are available, with either a lapel or a headworn microphone. The bodypacks TA4 connector allows the unit to be used with other Electro-Voice lapel or headworn microphones. Kramer Electronics’ VS-106 Audio Switcher/Amplifier is a unique switcher/amplifier for unbalanced stereo audio signals originally designed for the demonstration of speaker systems in a retail environment. The unit mechanically switches a single stereo line input to one output that can be either one of 10 unpowered unbalanced audio stereo line outputs, or to one of six 8 Watt RM S per channel amplified speaker outputs. The VS-106 allows the convenient side-by-side demonstration and evaluation of various powered speakers (also known as amplified or active speakers) and nonpowered speakers utilizing a single audio source. The VS-106 has one unbalanced stereo audio input on RCA connectors. On the output side, the unit has six powered speaker outputs on 4-pin push-type speaker terminals and ten line level unbalanced stereo audio outputs on RCA connectors. The VS-106 operates with a 12V DC power supply, and is housed in a standard 19 1U rack mount size, with rack ears included. Sanyo’s PL C-WL2503 XGA 3LCD interactive projector is geared for the educational and corporate presentation markets and provides full functionality regardless of the surface on which the image is projected. Unlike existing interactive solutions that require whiteboards or other surfaces with built-in sensors, the PL C-WL2503 operates when any screen or wall surface is used to display the projected image. 2500 lumens brightness and a 500:1 contrast ratio ensure picture quality and clarity, and an ultra-short throw lens creates images from 60 to 110 inches at a distance of no more than 47 inches from the screen. With an ultra short-throw lens, the PL C-WL2503 can create an 80-inch projected image from a distance of only 34 inches. The ability to locate the projector so close to the projection allows presenters to work next to the screen without casting shadows or having to avoid the projectors light beam. Soundcraft’s Si Compact Series is a powerpacked range of digital consoles that brings all the experience of Soundcraft’s digital mixing platforms to a very affordable price level for tour sound, corporate event, house of worship and theatre applications, amongst others. With full DSP functionality built-in to a small-footprint chassis, the Si Compact range provides up to 40 inputs to mix in three frame sizes. Motorized faders with patented Soundcraft FaderGlow operate on two layers, but the main difference from similarly priced mixers is the provision of a full encoder set for all the functions on a channel, from input gain through EQ and dynamics to bus controls. The Si Compact packs powerful digital mixing facilities along with stunning Lexicon effects into a trio of small footprint consoles available in 16, 24, or 32 mic/line input formats, with four stereo returns.